SW Florida Skydive Club is a friendly DZ and welcomes first time to experienced skydivers. When entering the dirt road, please no littering or speeding. Respect the 5 mph speed limit. Jumping requirements: Our DZ is a Group member of USPA. Please provide us with your current USPA membership, proof of your license status and a reserve packing card when you sign our waiver. Your log book might also be requested. Manifest: Manifest for loads only when you are ready to jump. Missed loads will not be refunded! Please be ready at the loading area when you hear your five-minute call. Requirements for take off: RIG MUST BE ON - leg straps and chest straps correctly threaded prior to boarding. Seat belts must be worn on the plane until 1,000 ft AGL - no exception. If you choose not to wear your helmet, you must secure it to your chest strap or seat belt. Exit orders: Bellyflyers - largest to small groups, Freeflyers - largest to small groups, Students, Tandems, Wingsuit flyers and CRW. Exit Separation: with reported upper winds of 0-10 knots, please allow between 5-7 seconds between exits (take into account the time it takes to climb out of the aircraft.) For winds of 15 knots or higher please use the following formula: Take Upper winds and divide by half which will give you the recommended amount of time between exits! 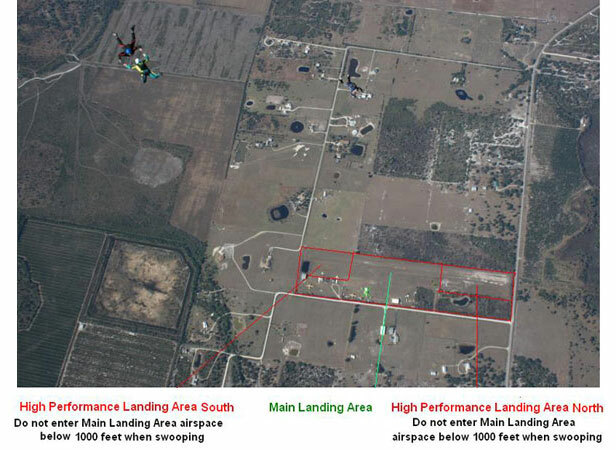 Landing rules: Check out the aerial map of the landing areas at manifest. We use a left hand pattern. First person down sets the pattern so follow the windsock if you are first to land. Tandems & Students have the right of way so watch for traffic. Be aware that students may land anywhere! Type of payment: We accept cash, traveler's checks, Visa and Master Card. All payments are done at manifest. Sorry, No credit.